We've had so many advancements in the past few years - landing a rover on Mars and the creation of an electric car that can go zero to 60 in a matter of seconds among them. One of the coolest things to come about may just be the advent of 3-D printing. No longer do we need to order a small part and wait for it to arrive in our mailboxes. Now, we can download a file and get a resin version of that same part in a matter of minutes. Innovators are getting more creative in terms of what we can print out, and the list of options is widening to include car parts and toys. With this new technology available in such small quantities (although it will hopefully will become more widespread), there is a new market for resources to accommodate the growing trend. According to 3DPrint, there are many new items that can now be downloaded and printed out for convenience, including a wedding gown. This is a development that could entirely revolutionize the wedding industry, or even the clothing industry as a whole. What new materials do we need to procure in order to properly manufacture a beautiful wedding dress? There is an entirely new enterprise for a substance that can be manipulated in such a way, and it appears that people are responding positively to the advancements. While the widespread use of 3-D printing for designing ready-to-wear clothing may be a bit far off, there are other applications that are right around the corner. Replacing a part in a phone or computer used to be something that only experts or enthusiasts could complete, but it might be something that we could all accomplish in the very near future. In 2014, Google toyed with the idea of 3-D printing parts of its phones, stated Tech Republic. This process is something that users could replicate at home to make their devices last longer. Brand loyalty will boom if a company allows you to fix your phone rather than purchase a new one altogether. Again, there is a certain set of materials that will need to be available on a large scale in order to accommodate this offering. 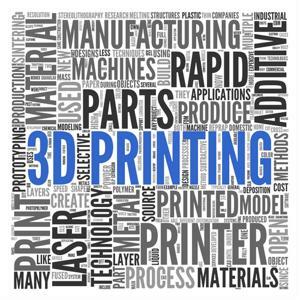 3-D printing still feels like something out of a science fiction movie, but it is undoubtedly here to stay. The market of procuring materials and parts for these machines will likely balloon as a result.